When a group of 22 people agreed to make a trip to Penang, any person would have been skeptical about the fortune of the organizers and the island of Penang. 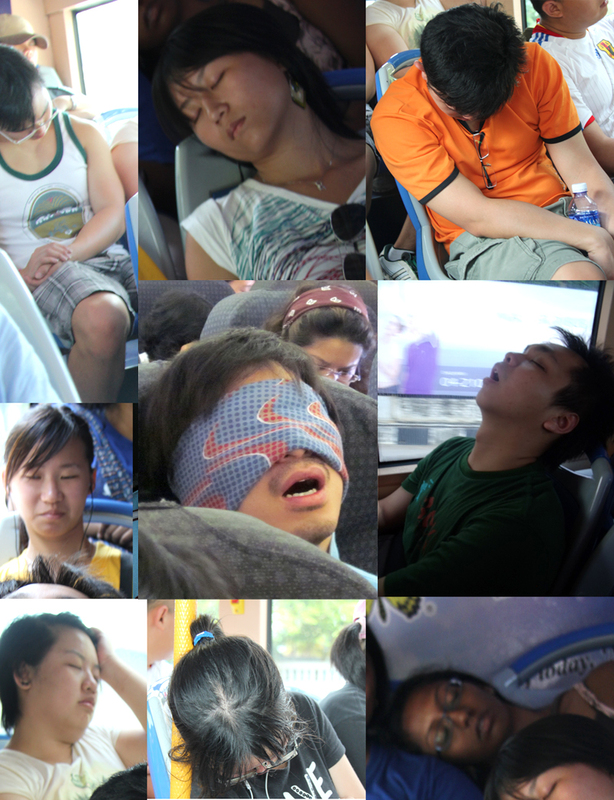 All be said, Evo Lab has made a safe and sound return to Singapore after a trip to the quaint island. Penang gave us a lot to remember- from sights of the old heritage town, to beautiful nature and to savoury flavours that would whet anyone’s appetite. 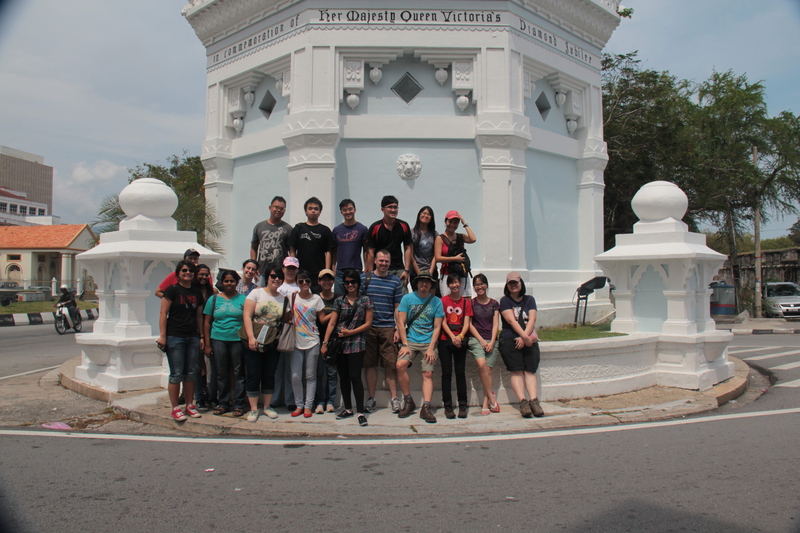 George Town itself gives an entirely different experience to the tourist. Narrow streets, rows of chinese shophouses, and temples, along with colonial architecture gave a sense of the unique heritage of the place. As one of us mentioned, “everywhere you look, there is a pretty building”. 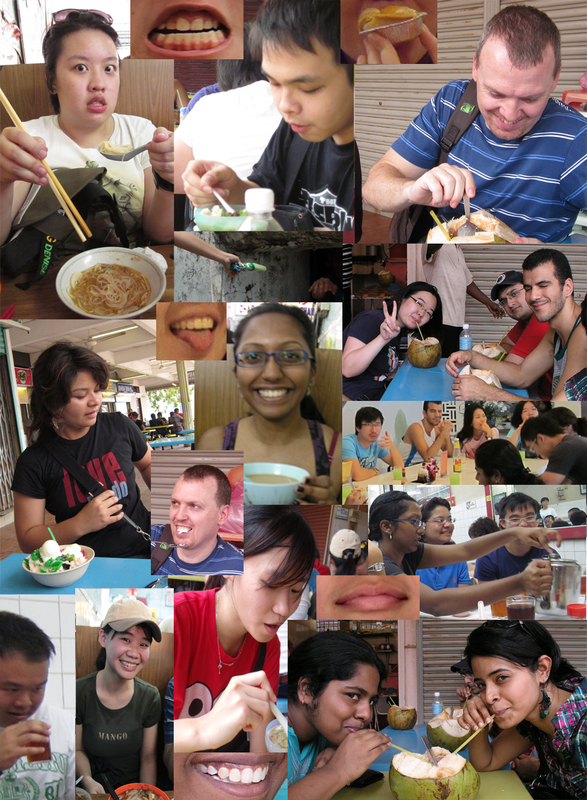 We certainly did not leave our Singapore identity behind while going to Penang. Food, we enjoyed. We ate a lot. And we talked about it a lot. 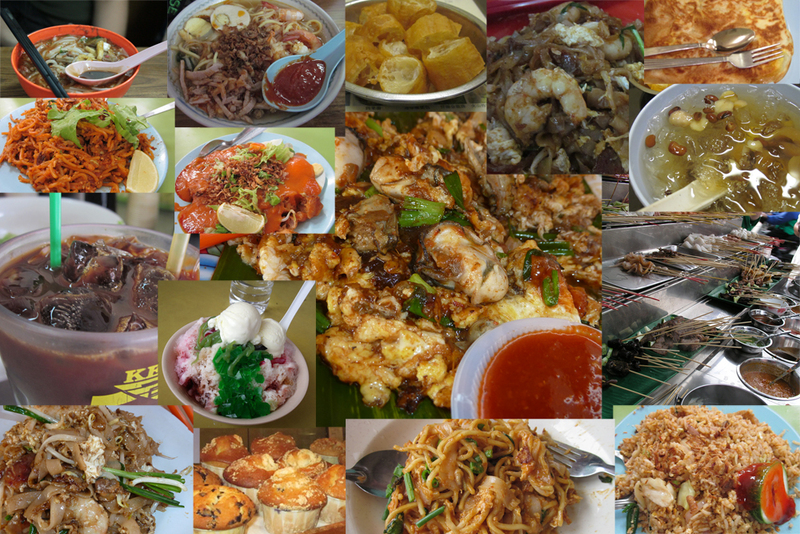 Laksas, Char kway teow and chendols would make the always-hungry bunch walk through the streets periodically. Penang trip was refreshing, and a good opportunity for us to spend some time together. What made it even more satisfying was that it turned out cheap , costing less than 200$ for 3 days! Thank you, Prof. Meier, and Denise and anyone who helped organize it. 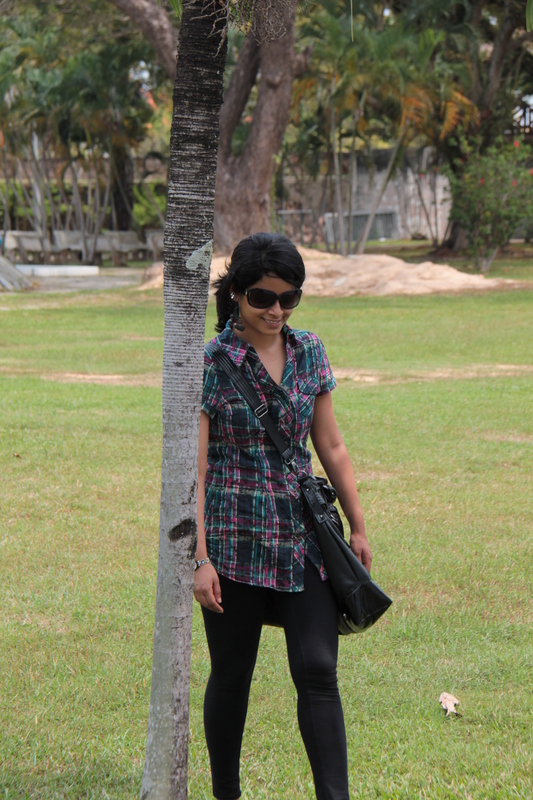 Besides the excitement that it gave us, the trip gave us chance to give a proper farewell to Sujatha (who was well prepared for the paparazzi’s attention), who has been with us for a long long time. Thank you, Sujatha, for everything. We will miss you, and wish you all the very best for the future. 3rd year Life Form and Function student, Ouyang Xiuling shares her recent botany practical notes with her classmates through her blog post entitled “LSM3261 Pract 1 – Leaf and stem pasar!” [pasar = Malay for market]. Isn’t that nice? Congratulations to all four presenters for a job well done! 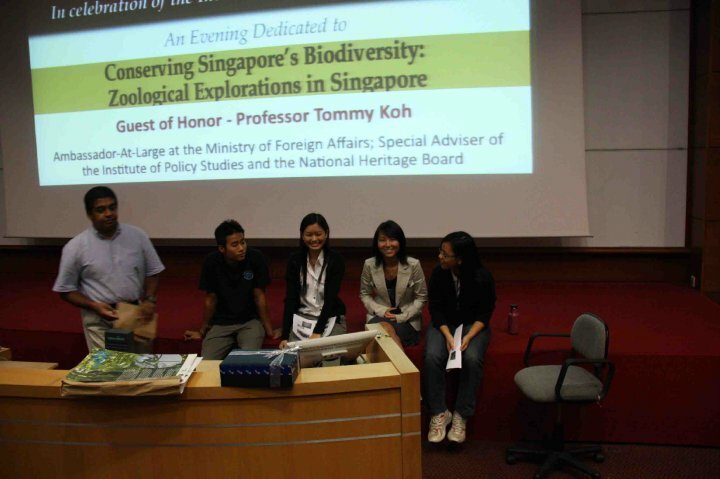 There’s a short write up of the “An Evening Dedicated to Conserving Singapore’s Biodiversity” event on the NUS website! You can access it here. It focuses on the work that Andie has been doing over the past 1.5 years with regards to the banded leaf monkeys. For those who want to see a bunch of photos of the excitement, the DBS website has devoted a page to them here. Thanks a lot to all the honours students who put up their posters for the event! They certainly helped to attract a lot of positive attention. Guess who’s working on reduviids and other bugs? Alumni Hwang Wei Song and his partner in crime Zahang Guanyang have taken up residence in Christiane Weirauch’s Heteropteran Systematics Lab at the University of California Riverside. 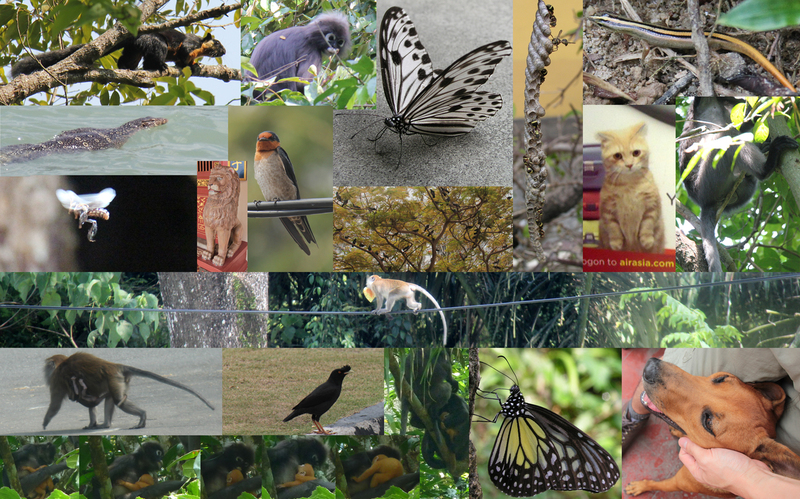 We don’t know yet what it is as we did have to get to work but said specimen will await Wei Song’s attention in future at the Raffles Museum of Biodiversity Research. Stop complaining about the blurry picture y’all, specimen’s in the museum! 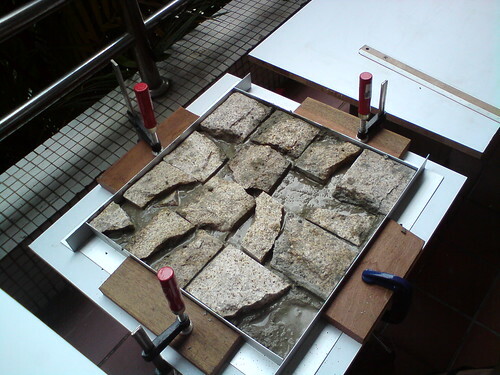 Yes, the ruckus this past week is caused by Marine Lab's Lynette Loke's seawall project. Construction materials have been appearing outside the Frog Lab and over time, a mini-seawall factory appeared. Lynette told me another 180 tiles would arrive this evening. But she has found help – the handy kungfu hands of a botanist no less, have been recruited to do the deadly dead of smashing tiles! How we love to see honours students hard at work – it motivates the rest of us!